It doesn't happen often, but there was a lotta love spread 'round and right for the legendary ladies of hip-hop during this year's VH1 Hip-Hop Honors. 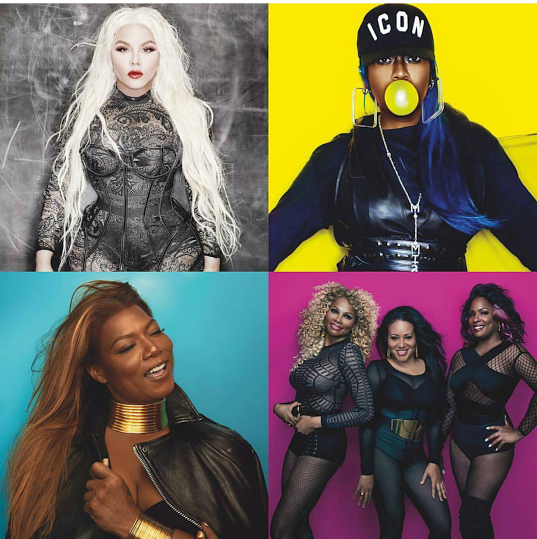 Queen Latifah, Lil' Kim, Salt-N-Pepa, and Missy Elliott were the top honorees of the night, but the entire show was pretty much a dedication to the efforts, music, and feminine fury that Black women have blessed the genre with since its fruition and it was wonderful to see all those influential women unite to celebrate and spread the #BlackGirlMagic. I mean, Faith Evans and Lil' Kim were putting sugar on old wounds --- it was truly a spectacle for the history books. In some ways watching these tributes (Lil' Mama and Teyana Taylor really slayed their performances) and seeing the outpouring of love towards these pioneers, put me in a emotional state, especially when the night closed out with Latifah rallying up a slew of legendary hip-hop dames that included Da Brat, Eve, Ms. Dynamite, Yo-Yo, MC Lyte, and Monie Love to perform the classic, "U.N.I.T.Y." It was as if we were saying goodbye to an era of when floacists were truly hot, cool and vicious, saying adios to the time when these dames reigned and made huge strides to be heard in a genre that has often been notorious for exploiting and dominating over women. Not to say there aren't women still rolling with the verbal punches in hip-hop, but more of today's new breed feel the need to pad their twerking butts and their Twitter feeds than to release music that packs womanist heat, especially in times like these when we need such unity and awareness. Hearing "Put Your Lighters Up", "Ladies First", "Monie In The Middle", "Shoop", etc. took me back and had me nodding my head again, remembering when I found myself for the first time really embracing what women were bringing to a genre I've always had mad apprehension towards. Maybe it's just me, but I just don't feel that kind of fervor and fight from the female side of hip-hop anymore, and it was great to see it brought out again, even if it was just for one night. So if you missed out, get your watch on and put some respek on these women's names. Oh, and Betty White? National treasure.